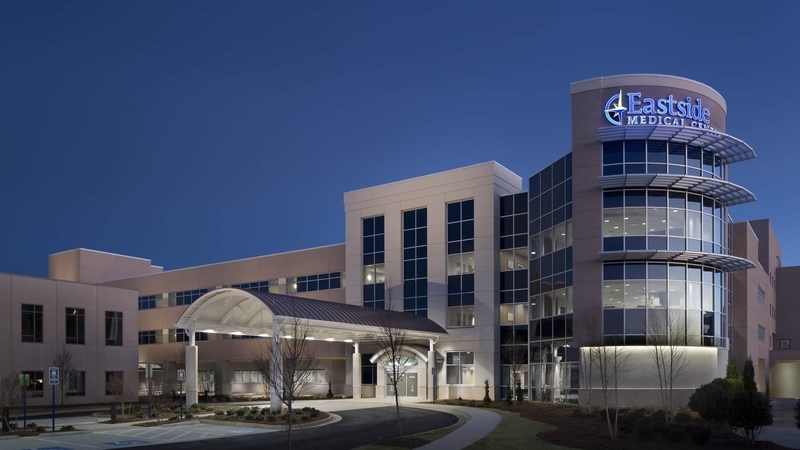 TMP designed a three-story bed tower expansion and first floor renovation for Eastside Medical Center to meet the growing demand for patient beds in a rapidly developing suburban market on the east side of Atlanta. The facility had no viable options for vertical growth, so the solution was to expand the hospital to the north at what is traditionally seen as the “back side” of the hospital, creating a second main entrance for the hospital. The catalyst driving the project was the facility’s need for additional bed capacity. This was achieved with the design of two adjustable acuity patient floors in the new tower. The bed tower addition also allows for needed expansion and upgrades to the Surgery Department, broadening the hospital’s overall surgical capabilities through the addition of a new Hybrid Operating Room, and expands other key support spaces on the first floor. 48 new adjustable acuity rooms for maximum flexibility. Expanded first floor, critical services including Surgery, Central Sterile Services, Lab, Material Management and Food Services departments. Efficient racetrack patient floors and incorporated LEAN design strategies. New tower structured for three future floors.